Thank you to everyone who has supported GrowMap over the years. A special thanks to the many collaborators who have shared my content and shared their knowledge. Kelli @kellibmiller and Crystal @CrystalandComp are two of my long time collaborators. They have been sharing what they know in their LearntoBlog Hangouts for almost 70 episodes and recently launched the LearntoBlog VIP Forum. Ann Smarty @seosmarty has launched MyBlogU where bloggers go to collaborate and promote epic content. Ann and Gerald Weber @the_gman created ViralContentBuzz which lets us share each other’s content on social networks. Adrienne Smith @AdrienneSmith40 is one of the few bloggers who has had a huge commenting community from way back when and still does today. It is a lot of work to answer all your comments and many of us get busy with other priorities. If you want to find the best CommentLuv bloggers, visit AdrienneSmith.net. Need a Book Written or Published? David Leonhardt @amabaie offers a really cool service. You can have a book edited or ghost written for you. If you want a book for yourself see A Personal Branding Book to Enhance Your Reputation. Tell David I sent you! Know anyone who could benefit from having their own book, you can earn a $1000 referral fee. Anyone who wants to be seen as the top person in their industry or location can benefit. You may have noticed the custom images created by Julie Weishaar @newhorizons123 or as example of one of her custom videos in the right sidebar on GrowMap. Julie is my go-to video person. Andy Nathan @AndyNathan has been researching how people become successful. You can see his video interviews on StartUpGap and he is publishing a book about what he has learned – due out on Amazon later this month. You can also find Andy @SmartattheStart. Deborah @SocialWebCafe is the only professional Google Hangout-on-air producer I’ve come across. She also provides Premium Twitter chat event services. Ron Cripps provides the primary support and hosting for GrowMap.com and has been one of my most loyal supporters. If you need web development or hosting talk to Ron. You can find Ron on Twitter @affiliatexfiles and @marketingtilt and find out more about his web services at MarketingTilt.com.au. Jim Bannon has been doing his best to teach brick and mortar businesses how to use QR codes to drive offline people to their online resources. If you want to track how well your print media and signage drives customers, be sure to check this out. He also offers Facebook Likes Generators. Many others are regular supporters of GrowMap. Look them up on Twitter or pop into their sites and say hello. Tell them Gail @GrowMap sent you. All of these people regularly retweet my content. Many of them are in our Blogger Mastermind group. We share paid opportunities, refer work to each other, share what we’ve learned over the years and more. Click that link to find out how to join us. Thank you to all my readers and supporters. Without you there would be no reason for this blog to still exist. Whatever your interests why go it alone? Tell me what you need in the comments and I’ll hook you up. Next year you could be in my 7 year old Happy Birthday post. Hey Gail, even though I’m a little late to the party! Happy birthday! Six years of content online is practically an eternity! included! Thank you and hopefully you’re just getting started! Mark would love you to read ..What The Mysterious Nigerian Businessman Can Teach You About Building Trust! Thanks, Mark. The years fly by and there is still so much left to do. Thank you, Nalan. I hope your site is doing well. Wish you luck …. I am a big fan of your’s. Thank you, Sofia. It is good to hear as sometimes it seems that we are working hard for years without benefiting enough people. I would greatly appreciate any fans to vote in the SmallBiz Trends Influencer Awards (link in CommentLuv in this reply). Happy bday Grow Map. Wish you loads of success in the coming years. Thank you for spreading your knowledge and have a great luck moving ahead…! Congratulations growmap! May you have many more years of successful blogging! Happy Birthday Gail or should I be saying it to GrowMap haha, always loved this site. My ticket website is only 4 years old – kinda love watching it grow. Thanks for taking the time to comment, James. Congratulations on your own site being 4 years old. Happy Birthday growMap and congratulations. Thanks for sharing great tips! Happy Bday, keep up the good work! I just discovered your blog and feeling we will learn a lot from you. Very Happy Bday to growmap.com and Hearty Congratulations to you Gail. Keep up the good work and keep sharing all the important knowledge in form of your blogs. Happy Birthday 😀 and WOW time flies right? Honestly, it seems like longer…lol. Congratulations for completing 6 years. Wish you success ahead. I am using growmap on all of my websites and it has turned out to be the best solution to save me from spam comments. God Bless You and have a bright future ahead. Thanks, Rajat. I can’t stand all the spam I get without the GrowMap anti-spambot plugin. It stopped working for a while and I was up to over 300 spam a day almost immediately. Be sure to check periodically for more features. Andy added some recently that took my blog back down to no botspam again. What a blessing that is! Congratulations Gail, here’s to the next 5 years. Your content is valuable so you deserve continued success. Thank you, Sue. It can be a challenge to juggle all the projects I have going, but as long as we can fulfill our calling and benefit many others it is worth it. Thanks, Arthub. Hope your business is doing well. Thank you. When you comment it is better to leave longer, more specific comments because short comments usually get deleted. Be sure to say something in the comment that makes it obvious you read the post. Do not include the title because that is what spammers do. Awesome. Glad to see that you completed 6 successful years in this online arena. Thanks Kuldeep. I had offers to sell GrowMap for a while, but I decided to keep on trucking. all comment are really beautiful thanks for sharing it. Happy Birthday Growmap.. I am one of a regular visitor from 3 years.. and really learned many things from this site..
How’s the dog training business? If you have any particular questions just ask in the comments or in live chat at http://SocialImplications.com. Many, many returns of the day, I am new on this blog, I want to be your supporter. I read your other blog post, especially about marketing, these are awesome, Thanks…. Keep posting…. Thank you for being a regular reader. Nice infographic about Google Plus. Happy birthday Gail…If you want to spend your holiday, here is a reference site that you can visit like, Komodo Island, Beautiful island of Lombok and the Gili islands snorkeling there and they exist in Indonesia. I don’t travel any more. I prefer to stay home, eat and drink healthy, and get more done online. It was so much easier to travel decades ago than it is today. Gail, congratulations! 6 years is quite an accomplishment in blogging! Thanks for sharing your sources that helped you along the way. I hadn’t heard of many of these folks. I know several of your posts have really helped me along the way. Thanks for all you do. Lisa would love you to read ..Are These 5 Things Really Annoying You In Your Twitter Feed? Lovely of you to stop by. Any time I can be of assistance don’t hesitate to ask. I have far more resources than I can get published. I hope you become a regular here. Check out the blogger mastermind group we have. Soyez le bienvenu. J’espère que vous reviendrez et visiter. Happy returns of the day GrowMap blog. Thanks for sharing great blogging contents. I learned great knowledge from your blogs. I really enjoyed your blogs. Thanks for sharing your thoughts with us. I appreciate your efforts. you are very creative with your blog and has some really good posts! Thank you. I’m never sure whether to call it a birthday or an anniversary. I guess is it actually both. Thank you. I am giving thanks that GASP is still keeping out the bots! Andy has done a great job of finding ways to defeat their flooding our blogs with spam. 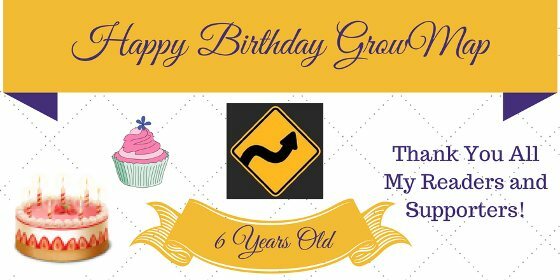 You are one successful blogger and thankfully you will continue to provide us with all that beautiful posts through growmap for another six years! Thank you. We never know what the future will bring, but I do hope to ramp up GrowMap again in the near future. Wishing your blog Growmap very very happy returns of the day. I learned a lot from this blog. Wishing to learn more in the coming years. Thank you, MSI Sakib. If there is anything in particular you want to know just ask. I have far more research than I could possibly publish. Congrats on creating such a wonderful blog that has stood the test of time. You do so much for your fellow bloggers and your work is extremely helpful to so many. Thank you, Ileane. I knew I would forget someone. Sorry I didn’t mention you in the post as you are one of my oldest collaborators. I keep in touch through who shows up in Topsy retweeting my content consistenly, so that is who gets mentioned in my posts. I do still look for your videos and podcasts when I’m creating content here and elsewhere. Its good to see that sharing the knowledge has got so many importance then ever before with the help of blogging. And I agree that Adrienne Smith is one of the bloggers who is very much concerned when it comes to blogging, engaging or approving whats good for the readers that will make a good knowledge base. Thank you, Aditya. Yes, Adrienne still has the kind of regular commenters many of us used to have. I’ve gotten busy with other tasks and really need to go out what we used to call “blog walking” more often. Thanks for taking the time to comment.